What a beautiful evening. We finally got a break from the incredible heat of last week with cooler weather yesterday and today, and a good soaking rain last night. Now we are getting another shower tonight! 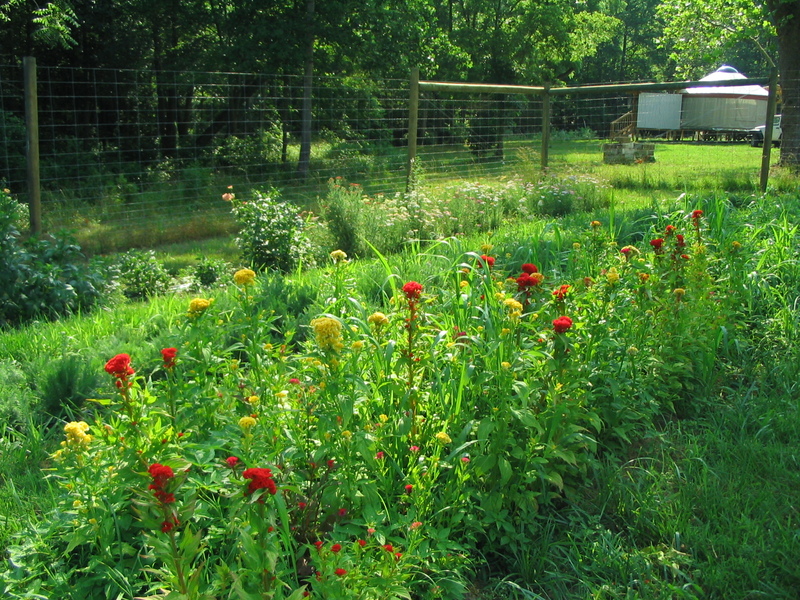 The garden is really blossoming. 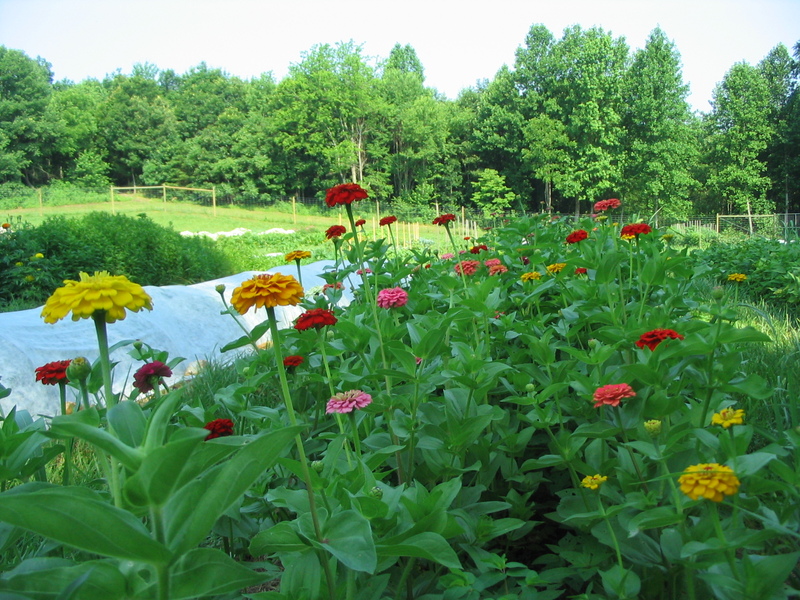 Everywhere we turn there is something new fruiting or flowering… whether it is something we planted or a weed. I hope this nice weather holds; it makes the work much more pleasant. 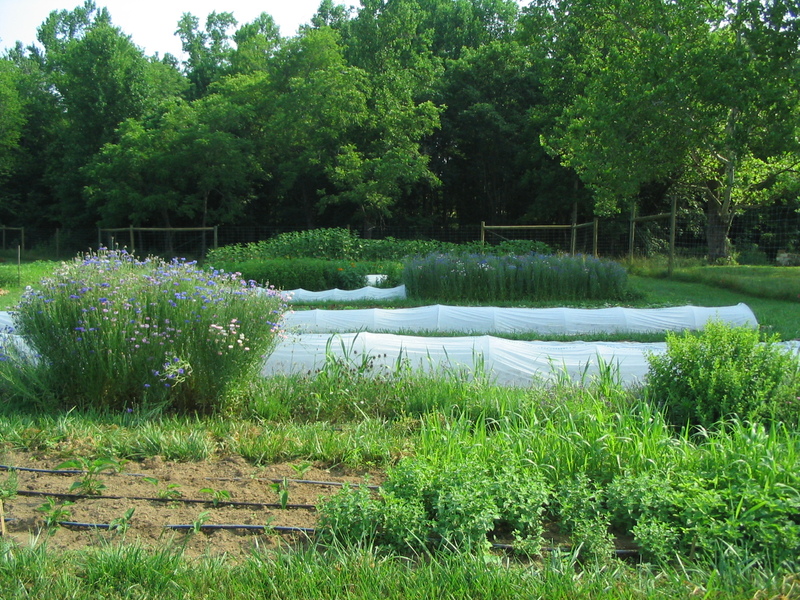 We did lose some crops to the extreme heat last week, but there is more than enough growing well to keep us busy. The gnats have come out, and they swarm around our heads as we work, making a loud humm. We didn’t have any gnats here last year or the year before. I guess they have finally found us. 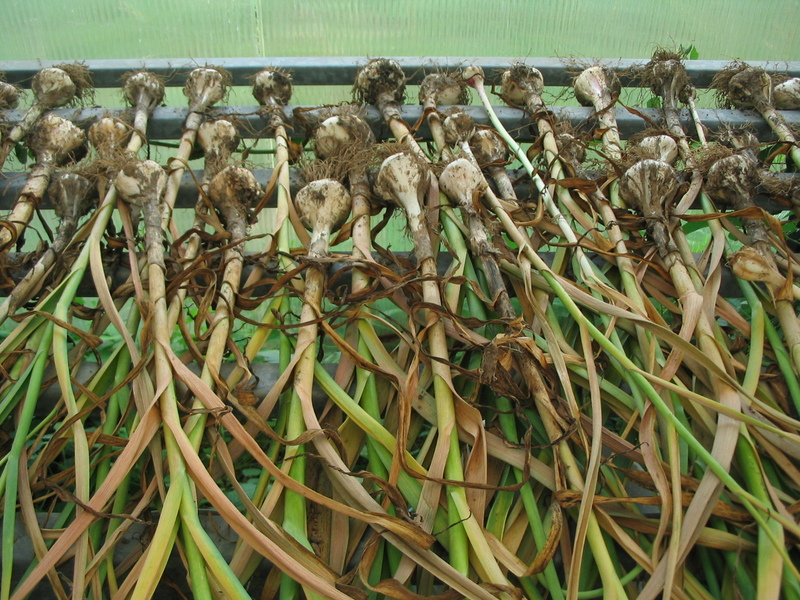 We harvested our small planting of garlic; now it is curing in the greenhouse. The bulbs are larger than I expected! We’ll have to plant a lot more for next year. 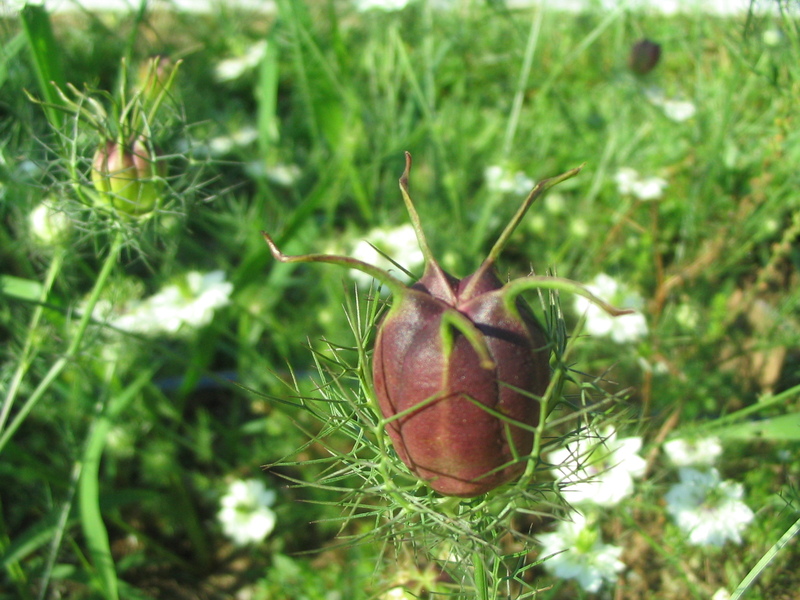 The nigella is forming its funny jester’s hat seed pods. This variety is ‘Cramer’s Plum’. 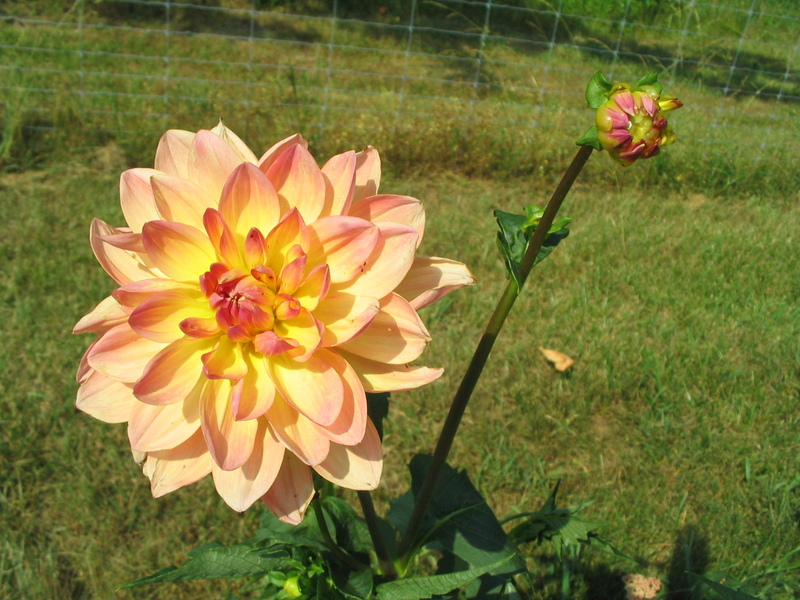 The first dahlia bloomed last week. You can see how dismal the grass looks: we hadn’t had rain in a few weeks when I took this picture on Friday. 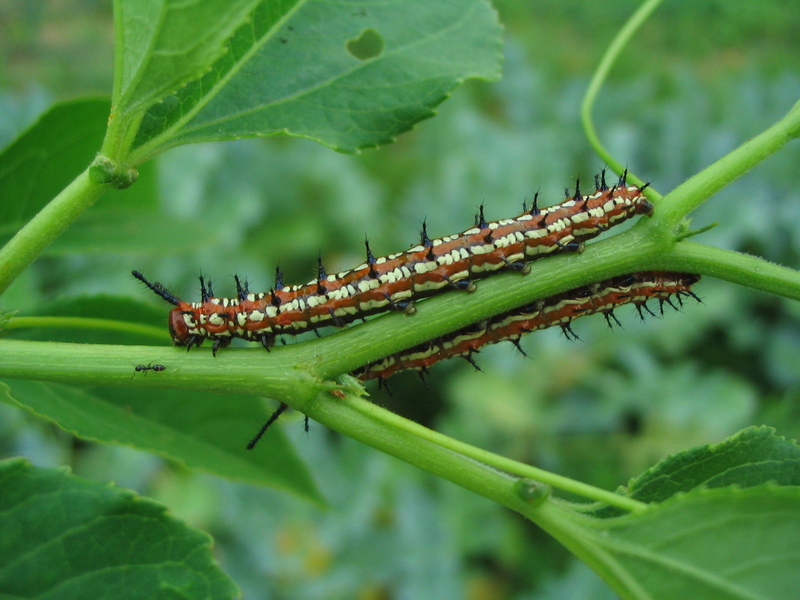 Saw these caterpillars while weeding last night. I’m glad I didn’t accidentally grab them. 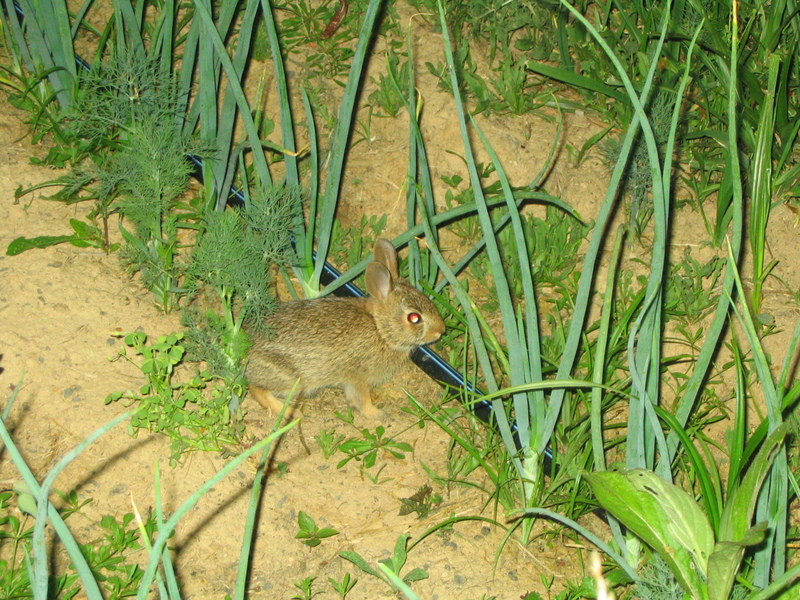 A bunny has taken up residence in the west side of the garden. 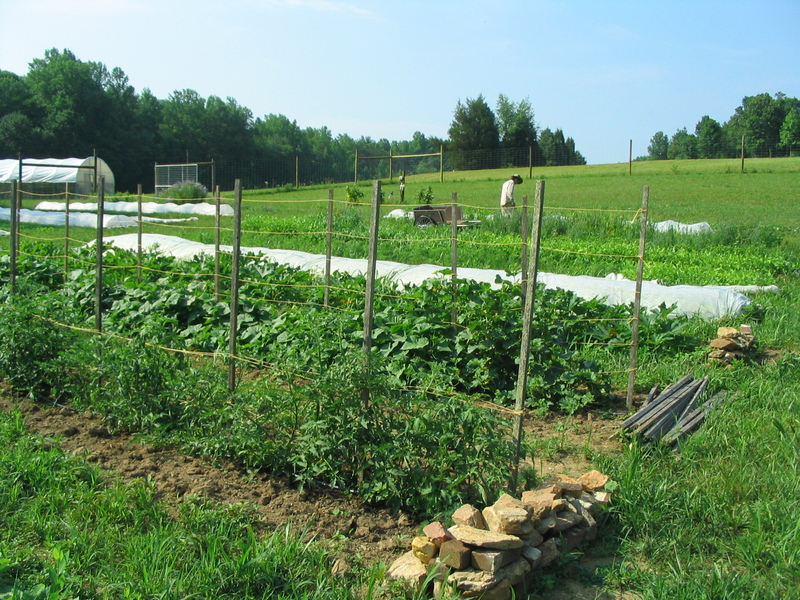 He likes the long row of tall perennials and the shade of the zucchini plants. I scared him out of the collards and here he is amongst the onions. Looks like they need some weeding attention. 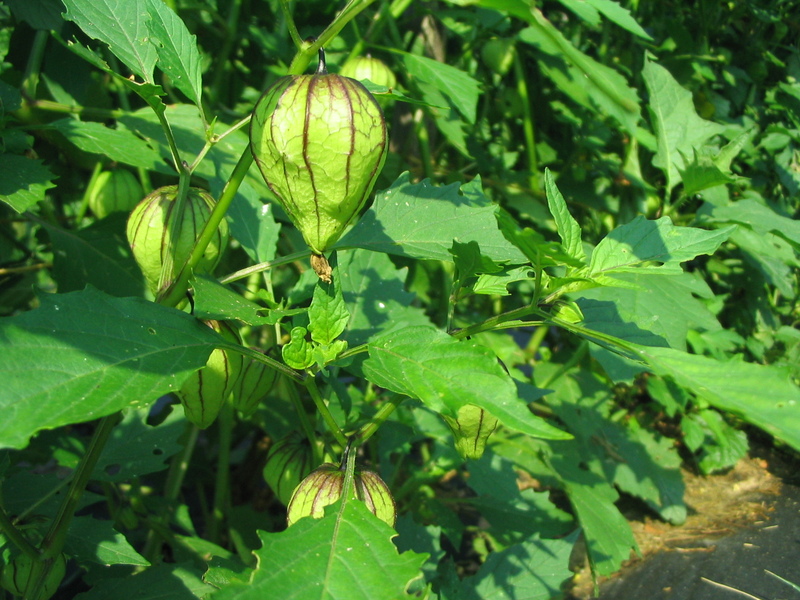 The purple tomatillos are forming inside their papery husks. 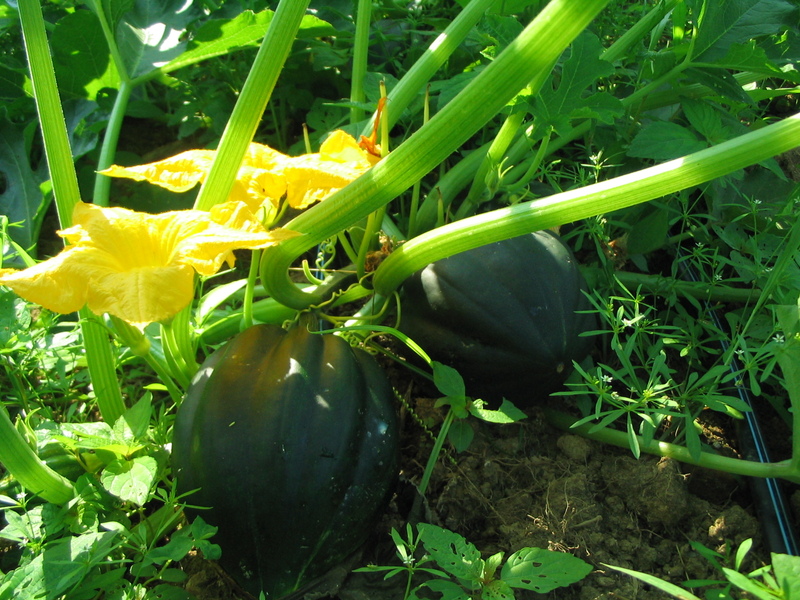 The acorn squash have set lots of huge fruits. We haven’t ever grown winter squash before, so thought we’d try it out this year. I have become enchanted with the celosias. The brain flower. The brains get bigger each week, and they are so flamboyantly colored. So exotic I think. My favorite are the pink ones, but they have all been cut so are not in this picture. 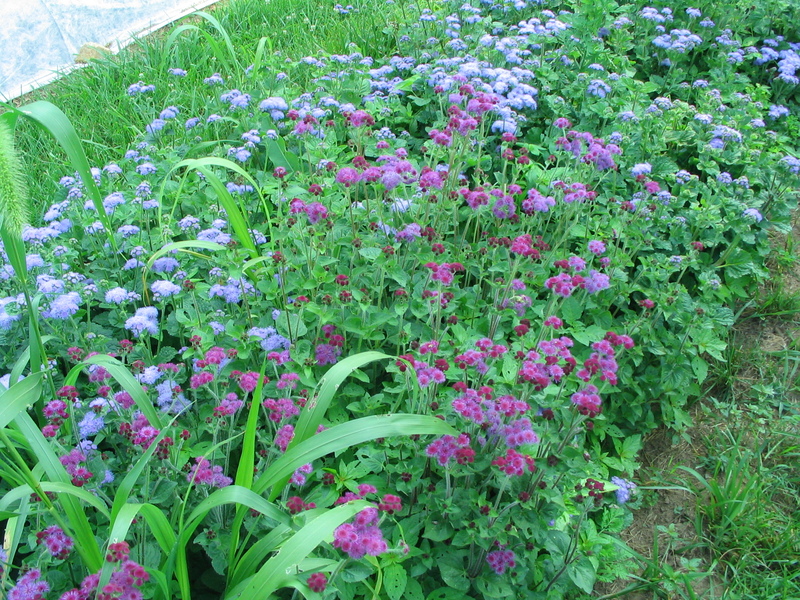 I like the colors of these ageratum: ‘Red Top’ and ‘Blue Horizon’. 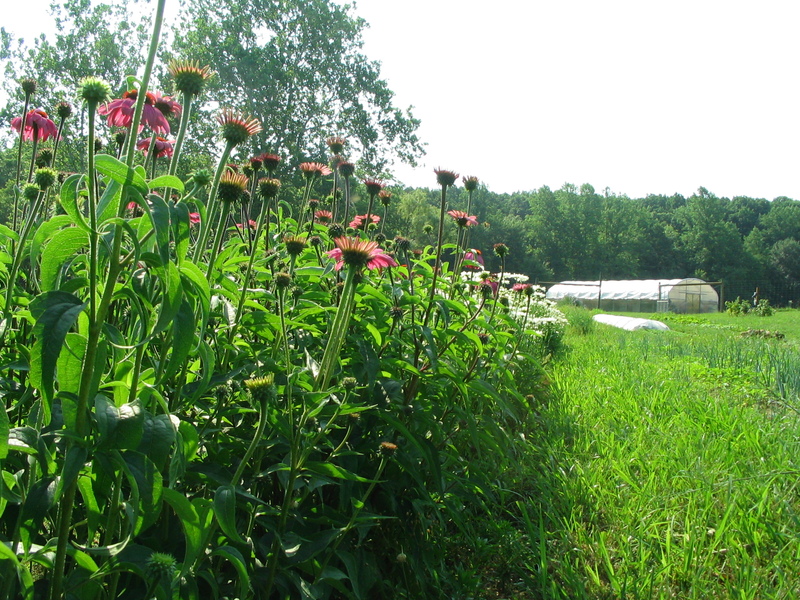 The echinacea I started from seed last year has really taken off this year. It is about 4 feet tall! You can see why the bunny might like it in there. One week until the summer solstice!